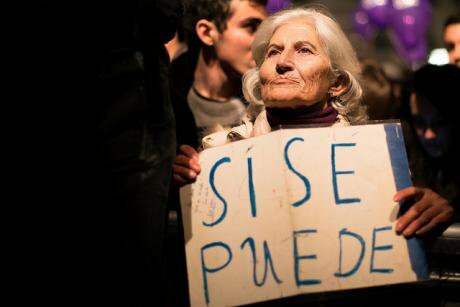 Podemos celebrate "the crack" of the bipartisanism in Spain. Flickr. Some rights reserved. This conversation is an excerpt from the book Construir pueblo published by Icaria Editorial, Barcelona, Spain. A translation into English entitled Podemos: In the name of the people will be published by Lawrence & Wishart in May this year. Mouffe: What led you to think differently? Errejón: In my case, getting to know the popular and constituent processes and the political transformation and state reform initiatives in Latin America was decisive in my way of thinking about politics. These processes are impossible to know from Spain. What you see in the media here is a tale of the never-ending, terrible mess allegedly existing in Latin American societies, which are considered infantile because they keep on voting the way they do. To some of us, the direct knowledge of experiences that can translate discontent into a new collective, popular and national will and can have an impact on the state has been very helpful. Collective will cannot change everything, but the state reform and transition processes involved are nevertheless significant. In any case, these processes are definitely helpful in thinking about categories and testing them, but whether they are models to follow is quite another matter. In our case, they cannot be taken as referents, due to huge and obvious cultural, geopolitical and economic differences. Our societies are not broken, our poverty levels are not as brutal as in Latin America in the final decades of the 20th century, nor is a progressive process, in our case, facing the challenge of building a national state almost from scratch. In Latin America, several popular processes have undertaken some historic tasks – such as citizen inclusion, creation of public services, or fiscal reform – which are similar to those developed by social-democracy in Europe. Admittedly, with more turbulence there, due to oligarchic resistances and the absence of peripheries bearing the brunt of the costs. Political change in Spain and Southern Europe is needed, precisely, in order to avoid the vicious spiral of indebtedness-expenditure cuts/poverty, social fragmentation and institutional collapse, as witnessed in several Latin American countries during the lost decade of the 1990s. It is not a matter of demolishing anything, but of preventing the selfishness and shortcomings of those in charge from demolishing the institutions and the protective mechanisms which are the collective heritage of our societies. M.: You have said that your experience in Latin America was instrumental, that it led you to see things quite differently. It was somehow your “road to Damascus”? E.: Yes, I began to be politically active at the age of 14, and for a long time I was active under quite different categories and from a quite different approach. At some point, I was much more influenced by what in Italy is known as the autonomy areas and by the practices of some of its thinkers, which fascinated us for their radicalism and their theoretical sophistication. Later, I combined this with other haphazard readings. And some Gramsci, to be sure. But then I landed in Latin America and I realized that the categories I was carrying in my bag were not enough. They were not helpful in reflecting on what was happening all around me, what I was experiencing. Not because of any cultural essentialism or de-colonial new age reason, but because I found myself facing events that forced me to think about the meaning of national, the state, power, hegemony - and what I was bringing with me were resistance categories. M.: In a way, something similar happened to me. I was a fairly orthodox Althusserian, but after some years teaching philosophy in Colombia, at the National University of Bogotá, I changed my perspective. This is why I decided to come back to Europe and specialize in political science and I began working on Gramsci. E.: On the other hand, when I arrived in Bolivia in 2006, I was strongly influenced by the anti-globalization protests and the reception of the Zapatista movement in Europe, but also the protests and the counter-power building in Argentina on December 19 and 20, 2001, the Brazilian Landless Rural Workers Movement (MST), the water and gas war in Bolivia – but not so much the following electoral process -, etc. Soon after arriving in Bolivia, I came across the national-popular concept, which by then had not yet been theoretically developed. I got to know it, to touch it, to read it. Not the theorists, but its developers, the people behind the national popular experiences in several countries in the region. I was already interested in nation building phenomena, such as the case of Catalonia, for instance, but in Latin America popular nationalism made me discover a new dimension. I admit I was fascinated by the ambivalence of the national-popular approach: the power of strong political identities that are not located within the right-left spectrum, their popular nature and their construction. I also began to be concerned about the state as an object of study and serious political engagement. I lived in, I worked with, I advised and accompanied processes of accessing the state and entering government by commoner or subaltern coalitions, surrounded by conservative powers that tried to limit change. So, I could see from inside a war of positions within the state, which I was directly involved in. I experienced the difficulties of trying out ideas, but this, far from discouraging me, opened a field of research which I found really exciting. I also learnt to value the costs of conquests and how to build irreversibility, which from then on became for me a central object of intellectual concern. I remember coming across some statistics in Bolivia which showed that, since the political change in the country, children tended to weigh more as a result of better access to milk. And I remember thinking that this may not have been thanks to socialism, but that on the other hand it would be foolish to rule it out, considering the costs of consolidating that precarious social development. Thinking about it now, I find it surprising that there has been no critical revision of the phenomena, the actors and the strategies which we chose during the crisis of the neoliberal model in Latin America. The Zapatistas, the Brazilian MST, the picket assemblies (piqueteras) assembled under the slogan “out with them all”, and all the theorizing which saw in this protest cycle a matrix for the practices that would change things in favour of the majorities which were building counter-powers outside the state: “changing the world without taking power”. Seen from today, the results are disappointing: where there was no electoral conquest of power and access to the state in order to wage within it a war of positions between emancipatory and conservative and oligarchic forces, social mobilization decreased – it always does - and today living conditions for the popular sectors are much worse. M.: For certain leftist groups in Europe, the influence of the Latin American experiences has gone in a different direction from yours and mine. I think it is odd, for instance, that several sectors of the European left continue to present the piqueteros experience in Argentina as a model to imitate. The literature that promotes the exodus strategy often celebrates this movement of unemployed people that began to organize street and road blocks against President Carlos Menem's neoliberal policies at the end of the 90s. As a matter of fact, during the economic crisis of 2001-2002, they gathered in cooperative organizations and were very active in the popular demonstrations that overthrew Fernando de la Rúa’s government. With their motto “out with them all”, they proclaimed their rejection of all politicians and called for self-organization of the popular sectors. Exodus theorists see piqueteros as a paradigmatic example of the political expression of crowds, and they present their rejection of any collaboration with the political parties as a model for the desertion strategy. They do not seem to realize that the piqueteros movement actually shows the limits of this strategy. Undoubtedly, they contributed to the overthrow of a president. But, because of their refusal to participate in the electoral process, when it came to offering an alternative, they were incapable of influencing subsequent events. If it had not been for the fact that Néstor Kirchner won the elections and began implementing progressive measures to restore the Argentinean economy and improve the situation of the poor sectors of the population, the end result of the popular protests would have been quite different. The democratic improvements that occurred in Argentina under Néstor Kirchner’s and Cristina Fernández’s governments were possible thanks to the synergy between the government and several social movements focused on addressing the social and socio-economic challenges facing the country. Far from offering a successful example for the desertion strategy, the Argentinean case revealed the shortcomings of such a strategy. What should be noted here is the importance of combining parliamentary and extra-parliamentary struggles in a common battle to transform the power configuration within the framework of pluralist democracy. E.: This is an important experience. On the one hand, many of those who stand for election do not come from an already established force. That is, they do not win because they already count on a political force backing them; they win because they participate in an electoral process that shapes a new identity. That is to say, Kirchnerism is a well-defined and relatively new political space in Argentina which still retains, at least for the time being, some power capacity. But, on the other hand, we need to evaluate the living conditions of the majorities today. In many Latin American countries, neoliberal reforms and their impoverishing effects met with strong political crises and cycles of social protest which had the power to even veto these reforms. Some of them coincided with elections which were presented as plebiscites between a decadent order and a new popular will in the making, and governments were formed which have been able to open constituent or state reform processes and deploy transformative policies that have improved living conditions for those at the bottom of the social scale. Where social protest did not impact the state and refused to enter the power struggle, the improvements achieved by the mobilizations were reversed when activism decreased or when the situation “calmed down”. Where discontent became a commoner irruption that broke into the state, transition processes, with all their contradictions and their more or less inevitable problems, have set in motion a virtuous circle by which millions of people have been taken out of poverty, while building national and regional sovereignty. I think it is obvious which experiences I am referring to in each case. A critical appraisal should be made of all of them, because some were really beautiful, with much predicament especially for the intellectual and cultural spheres of the European left, but they have not managed to change their countries and they have eventually found themselves in a dead end. I am not saying that it will necessarily be like this forever, nor am I saying that it is the expression of a paradigm: I am just describing what happened in that specific cycle in Latin America. Ultimately, in our societies a part of the political power derives from the ability to convince and to express this conviction in the electoral battle. There is another part of the political power that comes from the “barrel of a gun”, as Mao Zedong would say: enforcement capacity. We are, of course, talking about two ideal types, we are simplifying. But these are the two poles that define the options that power faces in decisive situations. There are not many more options, let us say, not many paradigms for accessing or building political power. M.: I find it really disturbing that, in the majority of South American countries, the so-called leftist forces are against the national popular governments. In Argentina, the parties that are supposed to be leftist oppose Kirshnerism. In Ecuador, they are against Correa’s government. E.: Indeed. This is so because these national-popular governments have also broken the rules of the traditional political game, that of the parliamentarian symbolic geographies. All the popular experiences in Latin America have been heretical, and have thus also broken the identification rules, they have built a commoner, popular national identity which has disconcerted not only the liberal and conservative sectors, and the privileged minorities, but also much of the cosmopolitan and Euro-centered left which, I believe, has traditionally misunderstood the situation in their own countries. Whenever there has been mass progress, history has been “brushed against the grain” - in the revolution bibles as well. They have always seen in it a political logic of their own, always with nationalist characteristics, contravening the handbooks (in tactical decisions, in operating procedures and the conveying of nodal demands, in the social sectors involved, etc.). Of course, manuals were created in Europe, and if they have never worked here… how could they work there! Peruvian Jose Carlos Mariategui has been vindicating a brand of socialism that would not “imitate or a carbon-copy” the European models. A socialism that would, for instance, allow for understanding and addressing the indigenous question beyond the narrowness of the classist moulds. Ultimately, it is a vindication of the importance of each cultural context and each political scenario. I think many have felt uncomfortable with all the national-popular experiences. All these populist constructions have unsettled a large part of the conservative sectors, as well as a large part of the left, not only in Latin America. This is unfortunate because, on the one hand, it deprives emancipatory thought of a field of applied discussion with which to elucidate questions and test proposals. It is as if these experiences, with all their difficulties, successes and failures, were unworthy of study and debate. On the other hand, it undermines support for a region which is today, objectively, a progressive and democratic pole in global geopolitics. M.: This “heretical” characteristic of the experiences you are talking about is undoubtedly one of the reasons for the existing hostility of the European left towards the progressive governments in South America. For instance, the French newspaper Libération is awfully critical, not to mention Britain’s The Guardian and Spain’s El País. I do not know of a single European so-called progressive newspaper that shows what is happening in South America with a minimum of objectivity. When someone asks leftists why they reject these experiences, they say that they are not leftist, but populist. They oppose an allegedly “good” left to a “bad” left. The good left would be Michelle Bachelet’s Chilean socialism, which is by the way very close to European socialism, and the bad left would be the Venezuelan brand, with Brazil and Argentina standing in between the two. It is interesting to see how the Bolivian model, which sparked at first some sympathy for its indigenous, “exotic” character, became a part of the “bad left” when Evo Morales moved closer to Hugo Chávez. Trying to find an explanation for this attitude, I arrived at the conclusion that it has to do with the concept of pluralist democracy as we understand it here, and to the attempt to impose a specific interpretation - that which is currently hegemonic in Europe - as the only legitimate one. The European left cannot accept the legitimacy of democratic institutions that differ from the European ones. In the Democratic paradox, which examines the nature of the western model of democracy - pluralist democracy, I describe it as the combination of two different traditions: the tradition of political liberalism, with its idea of the rule of law, of individual freedom and human rights, and the democratic tradition of equality and popular sovereignty. Contrary to those who declare that there is a necessary link between the two, I agree with Canadian philosopher C. B. Macpherson that it is a contingent historical relation, brought about by the joint 19th century struggles of liberals and democrats against absolutism. Thanks to this relation, liberalism was democratized and democracy was liberalized. This is why the ethical-political principles of pluralist liberal democracy are: freedom and equality for all. Nevertheless, this is a contingent relation, and not a necessary co-originality, as Habermas suggests. Carl Schmitt is right when he says that these are two logics, ultimately incompatible, in the sense that perfect freedom and perfect equality can never coexist. According to him, there is thus a contradiction between the liberal and the democratic logic, and this is why he thinks liberal democracy is a nonviable regime. My position is that we should not see this inability for reconciliation as a contradiction, but as “tension” – a productive tension, because it creates the space in which pluralism is possible. I believe it is very important that this tension be kept alive, that it should be constantly negotiated and re-negotiated, and that never an element should become totally dominant. But this is what has actually happened with the hegemony of neo-liberalism. E.: Yes, quite true. You were wondering where the hostility of European progressivism towards the so-called populist experiences in Latin America comes from. M.: Today, in our post-democratic societies, everything that has to do with democracy, understood as equality and popular sovereignty, has been rejected by the neoliberal hegemony. The popular sovereignty dimension is considered something archaic. This has become such a fundamental part of the common sense of the European left, that it has come to consider democracy simply as elections, a multiparty system and the recognition of human rights. What happened in South America, and what I find interesting in the progressive governments’ experience, is that they have reassessed the relation between freedom and equality and they have put popular sovereignty and equality back again at the command post, without doing away with the liberal dimension. And this is why the European left, which thinks that its own post-democratic model is the only legitimate one, when faced with the Latin American models, cries out: this is not democracy, this is populism! Why? Because they have invigorated again the democratic element? M.: It is true. In many cases, there have been liberal governments that were not democratic, and democratic governments that were not liberal, as in Argentina. E.: Convergence happened there to a lesser extent than in Europe. This is why some of the liberal principles are being used by the traditional elites as a trench against some progress on popular sovereignty, the institutions as trenches against the masses. As if every institution, just for the fact of being one, even if it does not respond to the needs of its people or is undemocratic, should always be preferable to the constituent irruption of the people. Even more, as if a regime could not be, at the same time, popular and republican, in the sense of promoting strong institutions, balance of power and accountability in a pluralist sphere. This is surely the challenge of the most advanced state reform processes. But it is impossible to grasp from a liberal paradigm which, after decades of disbelief and cynicism, has come to think that individual liberties are being threatened not by the oligarchic power of a minority, but by the building of new majorities and the comeback of affection and big words in politics. These prejudices always suspect that every collective ideal is totalitarian, and believe that only cynicism provides an antidote. In fact, they tend to empty the people’s democracies, and thus to imprint an oligarchic drift to our democratic-liberal political systems. I personally think that this fear of the popular element – especially when unframed or in its wildest and most ambivalent manifestations -, which is certainly deeply rooted in Europe, could have to do with the fact that we have had some fascist experiences here in the past, and that it is considered that these experiences exhaust all the possibilities of populist phenomena. Or even worse, that this is their ultimate hidden truth. So, any tendency to identify the nation with the people, crystallized in an emotional identification where leadership plays a role and where there exists a tense relationship with the opposition forces and the existing institutions, would entail a reactionary risk. Even though in other parts of the world they are deployed with an opposite political sign, that of democratization and redistribution of wealth. This not only blocks the possibility of thinking about change beyond alternation within the established institutions – and thus a frozen correlation of forces -, but also leaves out a large part of European history, and certainly Latin American too, where the experiences of mass inclusion to the state have a national-popular matrix. E.: I think there is something of an epistemological colonialism in all of this: “these are distortions, because pure phenomena are the ones that happen over here”. An intellectually ageing, politically old Europe is looking over the shoulder, let us say offhandedly, at the new experiences of collective will construction and transformation, which are always contradictory, with a lot of problems, many errors, just like all the real experiences, but which are analyzed and underestimated from a standpoint of cynical and colonial arrogance. M.: It has also a lot to do with the leverage of the neoliberal hegemony and the resulting common sense that has been created: a common sense that understands democracy from a strictly liberal perspective and disqualifies any attempt to question this situation by labeling it as “populism”. Translated from the Spanish original by Carmen Municio and Victòria Gómez, members of Democra ia Abierta’s Volunteer Program.